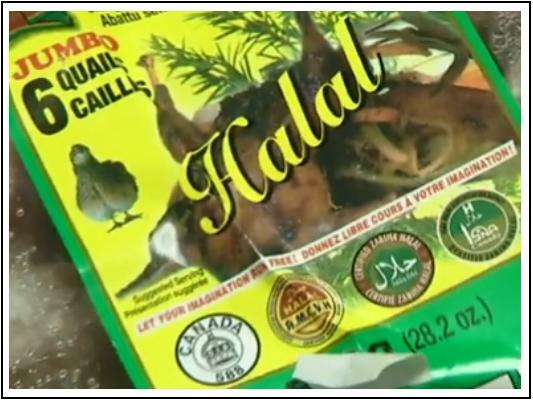 In her March 13 report broadcast on Dumont le midi TV show, journalist Caroline Lacroix revealed that Olymel pays thousands of dollars to the “Association des viandes halal that is controlled by Abou-Baker-Assedique mosque” located at 371 Jean-Talon E. in Montreal for the halal certification of its chickens. Mario Dumont – video 04:19: Nobody discussed the money issue. What does it fund? Where does the money go? Are we financing mosques without knowing it? It seems that this issue is even more taboo. Everybody is very careful not to talk about it. Point de Bascule spent the last few days at finding an answer to Mario Dumont’s legitimate question. Who is pulling the strings behind this Aboubakerseddik Mosque on Jean-Talon Street that receives commissions from companies like Olymel, that get their chickens halal certified, as we have learned on March 13? The mosque is part of a cultural centre. The centre also acts as an organization providing halal certification under a different name. We are dealing with one enterprise involved in two activities: management of recreation and culture and meat inspection. The certification agency is controlled by the Muslim Association of Canada (MAC), the main Muslim Brotherhood organization in Canada. MAC owns the building where the certification agency and the cultural centre are based and the administrators of the certification agency are former MAC directors or they have publicly endorsed MAC’s positions in the past. For the last ten years, MAC has been an important contributor to IRFAN-Canada, the Hamas fund collector in the country. Hamas is involved in a program aiming not only at the elimination of the state of Israel but also at the destruction of Western civilization. In a speech given on October 2011, its leader Mahmoud Al-Zahhar stated that “This (Western) civilization will not be able to withstand the great and glorious Islam.” The Canada Revenue Agency revoked IRFAN-Canada’s charity status in April 2011 after having concluded that it financed the terrorist organization Hamas. All products for which commissions are being paid to imams for halal certification should be properly identified. No public money should be spent to buy products that will be served in schools, in daycare centres, in military bases, in prisons and in other public institutions if these products have been certified by imams who belong to organizations that received money or gave money to terrorist organizations’ fund collectors or if they are involved in a project aiming at destroying Western civilization from within. It would be beneficial that private certification agencies be set up to guaranty that the products that they approve come from animals who have been desensitized before being slaughtered and that no profit coming from the sale of their certified products will go to the financing of Islamic jihad. The Aboubakerseddik Mosque belong to a cultural centre that bears the same name. The cultural centre is numbered 1165515017 in the Quebec enterprise registry. Its activities are described as management of recreation and culture. The center is also involved in halal certification under the name Association des viandes halal (AVH). Therefore, we are dealing with only one enterprise (1165515017) bearing two names and involved in two fields of activities. Before the Association des viandes halal (AVH – 1165515017) got involved in the certification business, it was the Association musulmane des commerces des viandes halal (AMCVH – 1161203071), also based at 371 Jean-Talon E., that was issuing the certification. 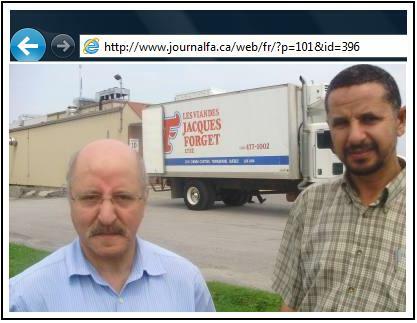 In a notice published in August 2011 in Alfa, a newspaper serving the Maghreb community in Montreal, AVH stated that it would replace the other organization (AMCVH) that had been certifying meat until then but that it would keep on using its logo. AVH will play the same role and offer the same services than the former AMCVH. In particular, it will use the same logo and it will certify Halal meat. All other Halal meat related services may be offered if need be. So that nobody ignores it. To serve and promote what is right. Done in Montreal on June 1, 2011. The second seal from the left was issued by the Association musulmane des commerces de viandes halal (AMCVH). 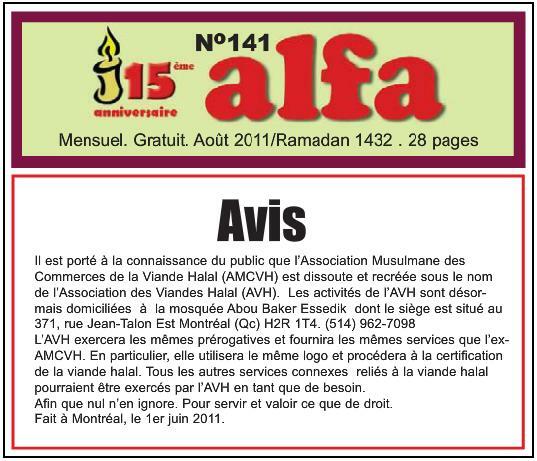 In a notice published in the August 2011 edition of Alfa newspaper, the Association des viandes halal (AVH) stated that after having taken over from AMCVH, it kept on using the other organization’s logo. Both logos on the right are issued by the Islamic Society of North America (ISNA), another organization belonging to the Muslim Brotherhood network. ISNA was recently involved in a financial scandal. The City of Montreal Property Assessment Service’s website indicates that the building including 371 Jean-Talon E. is owned by MAC since 2008. The building is located at the northwest intersection of Jean-Talon and St-Denis. It includes the following civic numbers – on Jean-Talon: 365, 369 and 371 and on Saint-Denis: 7160 and 7164. The first part of the 2008 notarized act of sale describing the building and identifying the purchasers is available by clicking HERE. Mohamed Hamrani – director in 2006.In Quebec, MAC is listed in the enterprise registry under the French name Association musulmane du Canada (AMC – 1160478880). AMC/MAC submitted its most recent annual statement to the enterprise registry on June 8, 2010. All administrators (including Lazhar Aissaoui – treasurer) were on MAC’s board of directors, as indicated in the 2010 report submitted to Canada Revenue Agency. At the time, Education Minister Line Beauchamp answered Monique Richard by denying that Dar al-Iman School was affiliated with MAC although the school’s website clearly mentioned it before being modified later. When Dar al-Iman Institute (the legal entity managing the namesake school) sued Rue Frontenac for defamation, Point de Bascule summarized all the elements linking the school to MAC in an article entitled Dar al-Iman School v. Rue Frontenac: The context of the defamation suit (École Dar al-Iman c. Rue Frontenac : le contexte de la poursuite en diffamation). Among those links, let’s mention that MAC and Dar al-Iman have acknowledged the affiliation that exists between the two entities in their respective publications. MAC goes as far as giving Dar al-Iman’s address on Henri-Bourassa as one of its own addresses in its file (1160478880) at the Quebec enterprise registry. Point de Bascule also revealed in 2011 that the Saudi embassy in Canada invited Muslims interested to travel to Mecca to contact MAC travel agency by faxing Dar al-Iman school: Dar al-Iman School’s subsidized resources being used by MAC travel agency and other subsidiaries (Les ressources subventionnées de l’école Dar al-Iman utilisées par l’agence de voyages de la MAC et d’autres de ses filiales). Before being named on the Association des viandes halal’s board, Mohamed Hamrani was on MAC’s board of directors in 2006 and on Dar al-Iman Institute’s board in 2001 and 2006. MAC’s (…) modern roots can be traced to the Islamic revival of the early twentieth century, culminating in the movement of the Muslim Brotherhood. (…) MAC adopts and strives to implement Islam (…) as understood in its contemporary context by the late Imam, Hassan Albanna (1906-1949), the founder of the Muslim Brotherhood. MAC regards this ideology as the best representation of Islam as delivered by Prophet Muhammad. In his 50-point manifesto, Hassan al-Banna promotes the abolition of political parties and the instauration of a one-party State, the reform of the law, so that it will conform to Sharia, an increase in the number of youth groups promoting jihad, the prohibition of dancing, the censorship of movies and plays and a dress code for all citizens enforced by a religious police. According to Global Muslim Brotherhood Daily Report that compiles and analyses information related to the Brotherhood network around the world, MAC and Hamas (charter – article 2) are among the rare Brotherhood’s local sections publicly acknowledging their ties with the Muslim Brotherhood. Jamal (Gamal) Badawi has been a member of MAC board of directors from 2002 to 2006. Based in Nova Scotia, he still takes part in MAC’s activities and is involved in the leadership of many other Muslim Brotherhood organizations in North America. Excerpt of the memorandum – The Ikhwan (Muslim Brotherhood) must understand that their work in America is kind of a grand Jihad in eliminating and destroying the Western civilization from within and sabotaging its miserable house by their hands and the hands of the believers so that it is eliminated and God’s religion is made victorious over all other religions. (…) It is a Muslim’s destiny to perform Jihad and work wherever he is and wherever he lands until the final hour comes. Goals being pursued by MAC with its halal certification campaign must be analysed within this wider context. To confirm that the halal movement is part of an offensive that aims at destroying the Western civilization from within, let’s recall that in December 2010, a Muslim Brotherhood leader in Europe, the mufti of Bosnia Mustafa Ceric, has openly urged Muslims “to conquer the world through Halal movement” in a speech given in Islamabad (Pakistan) during the Global Halal Congress. Point de Bascule has recently published an article explaining how the halal movement can be used to facilitate the project of conquest evoked by Ceric: December 2010: A Muslim Brotherhood leader in Europe urges Muslims “to conquer the world through Halal movement” (Décembre 2010 : Un dirigeant des Frères Musulmans en Europe encourage les musulmans à «conquérir le monde via le mouvement halal») also GMBDR: Bosnian Grand Mufti Urges Muslims To Rule World Through Halal Food . Mustafa Ceric, former MAC director and Muslim Brotherhood leader in North America, Jamal Badawi, and Youssef Qaradawi, the Brotherhood spiritual guide, all belong to the European Council for Fatwa and Research. MAC has given its support to the terrorist organization Hamas after it was described as such by the Canadian government. MAC has funded and received money from organizations that fund terrorism. MAC endorses individuals who justify terrorism. MAC’s activity in Canada is part of the general Muslim Brotherhood project to destroy Western civilization from within so that their totalitarian ideology is made victorious. In April 2011, Canada Revenue Agency revoked IRFAN-Canada’s charity status for having funded Hamas. From 2001 to 2010, MAC has transferred $296,514 to IRFAN-Canada, Hamas fund collector in Canada, according to information supplied by MAC to Canada Revenue Agency. Wael Haddara, MAC actual president, was on IRFAN-Canada board of directors in 2000 and 2002. On March 22, 2004, MAC has openly supported Hamas in a press release. It did so after the Canadian government had put Hamas on a list of terrorist organizations. MAC justified its support to Hamas by claiming that this organization was involved in humanitarian work. In sections 80-84 of the case R. v. Ahmad 2009 CanLII 84774 (ON SC)(that concerns another organization than MAC), Mr. Justice Dawson explained that, when a Canadian organization fund humanitarian activities in Gaza, it allows Hamas to free up money that would have been spent for civil purposes and to direct them toward other purposes. Therefore, it is impossible to dissociate contributions made for Hamas humanitarian activities in Gaza from those that are made to support its terrorist and military activities. After the terrorist attacks that occurred in Toulouse at the end of March 2012, French president Sarkozy banned Ekrima (Akrima) Sabri from entering France. 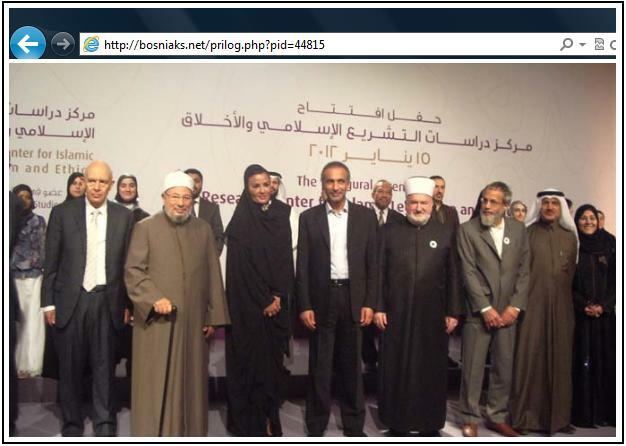 He had been invited to attend a convention organized by the French section of the Muslim Brotherhood in April. MAC and Dar al-Iman Institute have received money from the Saudi organization World Assembly of Muslim Youth (WAMY) in 2001 and 2002. On February 11, 2012, Canada Revenue Agency revoked WAMY’s charity status after having concluded that this organization had given $50,246 to Benevolence International Foundation that was funding al-Qaida. MAC frequently invites Munir El-Kassem to address its militants. El-Kassem is the MSA’s chaplain at the University of Western Ontario (London). MSA (Muslim Students Association) was the first organization set up by the Muslim Brotherhood in North America in the sixties. An NYPD report (page 68) states that this organization is an “incubator” for radicalization. In 2009, the World Islamic Call Society’s website (WICS) identified Munir el-Kassem (Qasimi) as a leader of the World Council of Islamic Call (WCIC). In his Dictionary of Islam (Oxford, 2004), John Esposito identifies WCIC as a WICS’s substructure. Initially known as the Islamic Call, WICS was set up by Gaddafi to fund international terrorism and further the Islamization of non-Muslim countries. WICS’ implication in terrorism was demonstrated during Abdurahman M. Alamoudi’s U.S. trial in 2004. In his plea bargain, Alamoudi admitted that WICS’ interreligious activities had been a cover for transferring Libyan funds toward Hamas. He was also involved in an assassination attempt ordered by Gaddafi. 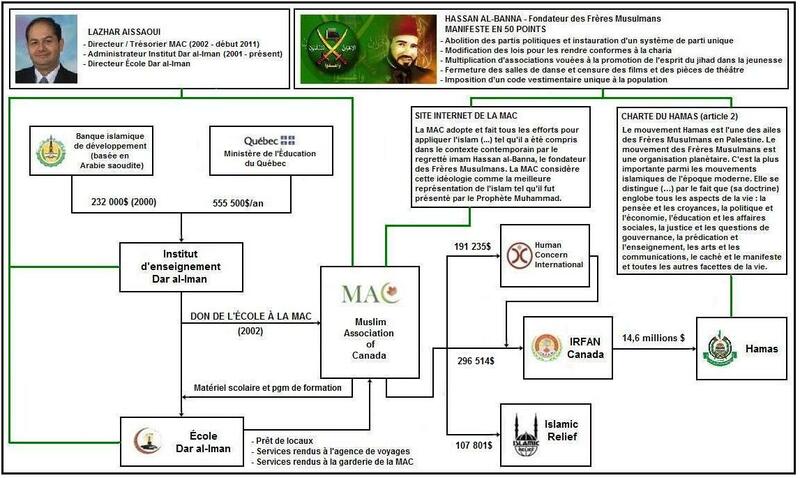 In addition to Munir El-Kassem, other individuals and organizations linked to MAC and operating in Canada have been associated in the past with the Islamist offensive led by the Libyan regime. In the fall of 2011, Islamist preachers Abdur Raheem Green and Hamza Tzortzis decided to cancel their speech at Concordia University after protest by human rights activists and MAC hosted them in its own facilities. Islamists who come from abroad would be unable to operate in Canada without the full support of the local and permanent Islamist infrastructure that hosts them. It is important to denounce these Islamist visitors. It is even more important to try neutralizing the local and permanent Islamist infrastructure hosting Islamist visitors and destroying us from within. Since we now know that MAC, which has facilitated these two Islamists’ stay in Montreal, is the main beneficiary of the commissions being paid for halal certification, we could add that it is illusory to think that we will succeed at slowing down the Islamist expansion in Canada if, while MNAs express their indignation about radical remarks made by Islamists in MAC’s premises, government’s agencies subsidize MAC infrastructure and buy products for which this organization receives commissions. In 2005, two teachers at Abraar School in Ottawa praised a pupil’s essay that condoned the killing of Jews. The Ottawa Citizen was notified about the situation by somebody who noticed that the text was put on display in a glass case at the entrance of the school. Abraar School in Ottawa, Dar al-Iman School in Montreal and other organizations are listed as “MAC institutions” in a MAC document (p. 3). An article published by The Telegraph (London, UK) about the affair is still available on the web. MAC Youth presents Qaradawi’s books in publications such as Le Rappel that the organization publishes for mobilizing young Muslims. 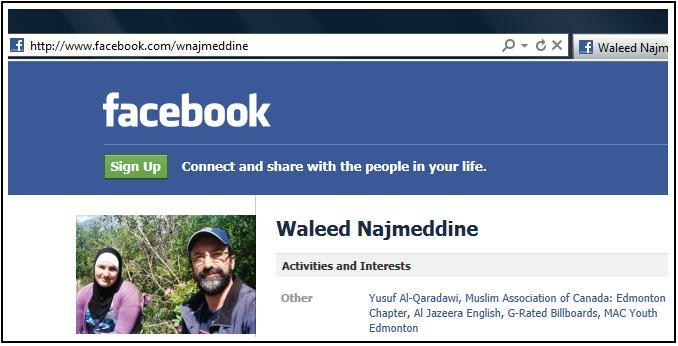 Issam Saleh, MAC Edmonton chairman and Waleed Najmeddine, a Muslim Brotherhood website OnIslam collaborator have developed an Islamic studies program for Edmonton public schools by resorting to Qaradawi’s book The Lawful and the Prohibited in Islam. As pointed out in a previous article about halal certification, it is precisely in this book that Qaradawi states that “Islam intends to block all avenues leading to what is haram (non-halal).” By applying this principle, another Muslim Brotherhood leader, Mustafa Ceric, has concluded that Muslims could “conquer the world through Halal movement” at the Global Halal Congress in Islamabad (Pakistan) in 2010. In 2008, the Home Office denied a visa to Qaradawi to prevent him from entering Great Britain. The British authorities justified their decision by stating that Qaradawi was seeking to “justify acts of terrorist violence or disburse views that could foster inter-community violence”. Qaradawi’s positions favorable to suicide bombings against Israel and its citizens are well-known. Since its early days in Egypt, the Muslim Brotherhood encouraged the use of suicide bombings to impose its totalitarian ideology. An article published by the New York Times on February 4, 1949 mentions the existence of a 200-individual squadron ready to launch such attacks. He declares legitimate to resort to coercion to impose his totalitarian ideology (“changing wrong by force whenever possible” Priorities of the Islamic Movement, chapter 4). He describes the mosque as a political institution. The picture appeared in the August 2009 edition of Alfa, a newspaper serving the Maghreb community in Montreal. (Translation PdeB) Jaziri wanted to be the only halal meat certifier and he was planning on charging 50¢ per pound. With an average consumption of 30 kilos of meat per person per year, butchers rapidly figured out how much they would have to pay. With dismay, one of them, whose shop is near Jean-Talon public market, figured out that he would have to sign a cheque for $140,000 a year! There was no way that he would spend such a sum and give it to this “self-proclaimed guardian of the institutions”. The challengers retorted by setting up the Association musulmane des commerces de viande halal (AMCVH). OICVH was put at the bottom of a drawer. PART 6 – AMQ , ANOTHER OF MAC’S ORGANIZATIONS AT 371 JEAN-TALON E.
Among the numerous organizations set up by MAC, there is at least another one whose official address is 371 Jean-Talon E. It is the Association musulmane québécoise (AMQ). This organization did manifest itself during the Bouchard-Taylor Commission by submitting a brief. One of the most ubiquitous tactics of the Global Muslim Brotherhood is the establishment of a dizzying number of organizations and initiatives (…) which create(s) the impression of broad based support when, in reality, the sponsors are the same individuals and groups whose leaders have not changed in many years. This excerpt deals with the payment of commissions by Olymel to Aboubakerseddik mosque. We understand that the inspectors working for the Department of Agriculture and Fisheries, (…) for Health-Canada are paid with our taxes. Who does pay for these inspectors? You mean that the slaughterhouse must pay the Muslim community some kind of subscription to get certified. Yes. It must pay the Association des viandes halal that is controlled by Abou-Baker-Assedique mosque located on Jean-Talon Street in Montreal. There is a monthly payment also, a contribution that goes according to the production of halal meat by the slaughterhouses. Therefore, we are talking here about many thousands of dollars. But listen carefully to Olymel spokesman who refuses to answer our question. There are procedures that cost … different amounts of money. Now, I cannot get into the specifics. I cannot tell you the cost of this certification. This is certainly … for a one year-period, with our volume of production … in the range of many thousands of dollars. We can sense that the gentleman is not very enthusiastic at answering this very question. He did accept to answer the other ones. … that is located on Jean-Talon in Montreal, the Abou-Baker-Assedique (Aboubakerseddik) Mosque. This is a way to fund the mosque. (…) We are talking here about many thousands of dollars when we look at the list of the slaughterhouses that belong to the association.